Can Dogs Eat Lettuce – Is it Safe for Pets to Eat Lettuce? Lettuce is great in salads and on sandwiches and many other dishes. While humans consume their meal that is rich in lettuce a dog may want some. Dogs may eat a salad that you walk away from which contains lettuce or a sandwich if given the opportunity. What make lettuce healthy or unhealthy to diet? Lettuce is high in water content and iceberg lettuce can help aid in daily vitamin requirements. Lettuce is used as a way to stay healthy by cutting calories and keeping well hydrated. Lettuce provides humans with health benefits such as, inducing sleep, aiding in anti- inflammatory, neuron protecting, muscle development, skin care benefits, and helps with anxiety. Lettuce has many health benefits for humans, but what about Dogs? Dogs eat grass and other leafy greens all the time, but are they safe? Truth is lettuce and other leafy greens such as kale and spinach all offer dogs healthy benefits. Although a dog needs a high protein diet; they are omnivores and can fully digest plant foods as well. Dogs gain antioxidants from green plants that help fight cellular aging. Lettuce and other greens are important to a dog’s health, providing digestive benefits. Lettuce offers a healthier alternative to grass for dogs which may contain toxins that can harm dogs such as; pesticides, fertilizers, and pollutions from mowers and vehicles. Preparing lettuce for human consumption and dog consumption differ greatly. Most humans add dressings and condiments to lettuce to add flavor and even cook lettuce. For dogs though the nutrients and minerals are important and as lettuce cooks it loses many active enzymes needed. When picking which lettuce to go with choose darker greens over light as darker green has higher amounts of vitamins and minerals. To treat dogs to leafy greens raw or cooked, chop them up well and mix them with their regular food so that they are more likely to eat them. Start with small amounts for easier monitoring to ensure the dog doesn’t eat too much and get an upset digestive track. Adding lettuce to a dog’s diet has many health benefits, but like humans new foods can cause slight digestive irritants. Although lettuce is healthy each lettuce offers different amounts of vitamins and minerals, some may contain more than a dog may need, which is also why small amounts go a long ways. If in doubt, ask a veterinarian about the dog’s health and what they recommend for the dog’s diet where fruits and vegetables are concerned. 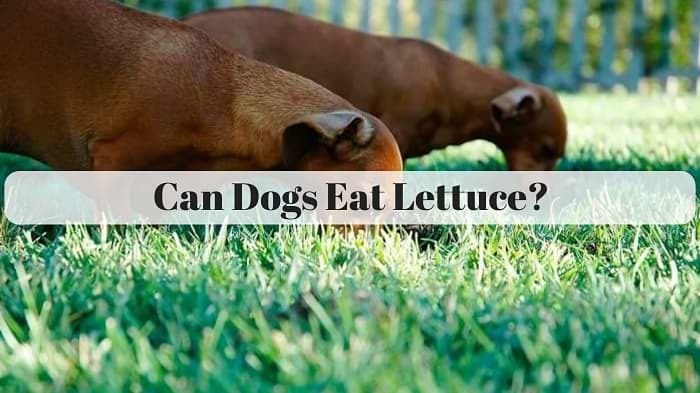 Lettuce provides health benefits to humans and dogs alike; some lettuces may be a better choice than others based on the dog’s needs and what they will eat. Dogs eat leafy greens all the time including grass; lettuce is a safer green for them. When concerned about a dog’s diet contact a veterinarian about their health.